Sitting on the so-called “Pacific ring of fire” with nearly 170 active volcanoes. Indonesia is blessed with enormous geothermal resources. The geothermal energy reserves that have been confirmed span from Sumatra to East Nusa Tenggara have the potential to produce up to 27,000 megawatts of electricity or 40% of the world’s geothermal resources. Half of these potensial are found in Java and Bali, the most densely populated islands in Indonesia. In 2010 The Energy and Mineral Resources Ministry has revised the country’s geothermal potential to 28,100 megawatts across 265 spots, a figure equivalent to 12 billion barrels of oil and almost twice the size of Indonesia’s oil reserves. The geothermal energy that is currently being generated in Indonesia totals less than 5 per cent of this potential figure at 1,200 MW. As a comparison guide the United States currently produces 4,000 MW and the Philippines currently produces 2,500 MW. Proposed JB Van Dijk in 1918 to harness geothermal energy resources in the area of the crater Kamojang, West Java, is the starting point for the history of geothermal development in Indonesia. By coincidence, the event coincided with the beginning of geothermal in the world, namely in Larnderello, Italy, which also occurred in 1918. The difference is, if in Indonesia is still a proposal, the Italian business has produced natural steam that can be harnessed to generate electricity. Kamojang geothermal field, with the well named KMJ-3, which produced steam in 1926, was a milestone in geothermal drilling the first exploration by the Dutch colonial government. Until the year of 1928 has made five geothermal exploration drilling, but the one succeeded in producing steam was only wells KMJ-3 with the depth of 66 meters. Until now KMJ-3 still produces natural dry steam with a temperature of 1400 C and pressure of 2.5 atmospheres. Since 1928 Indonesia’s geothermal activity practically stopped and only resumed in 1964. From 1964 to 1981 investigation of geothermal resources actively conducted jointly by the Directorate of Volcanology (Bandung), Institute for Manpower Problems (LMK PLN and ITB) by making use of foreign aid. Year 1972 has been drilled at six geothermal wells in the mountains of Dieng, with depths reaching 613 meters. Unfortunately, from the six wells that none have been found geothermal steam. A more comprehensive investigation in Kamojang conducted in 1972 involving geochemical, geophysical, and geological mapping. In that year Cisolok, West Java, and the crater Ijen, East Java, also conducted an investigation. Then in 1974, Pertamina was active in the activities in Kamojang, together with PLN, for the development of power generation by 30 MW. Completed in 1977. At that time New Zealand provided funding assistance amounting to 24 million New Zealand dollars from 34 million NZ dollars demand. The shortage was financed by the Government of Indonesia. In addition, Pertamina is also developing two monoblock with a total capacity of 2 MW in the field of Kamojang and Dieng. Inauguration was made on 27 November 1978 for Kamojang monoblock and on May 14, 1981 for Dieng monoblock. Kamojang Geothermal power plant itself was inaugurated February 1, 1983 with a capacity of 30 MW. There was a significant development happened in Kamojang occurred in 1974, when Pertamina with PLN to develop the geothermal field. A geothermal exploration wells with a depth of 600 meters which produces geothermal steam with bursts up the temperature on the pipe flow line in 1290. 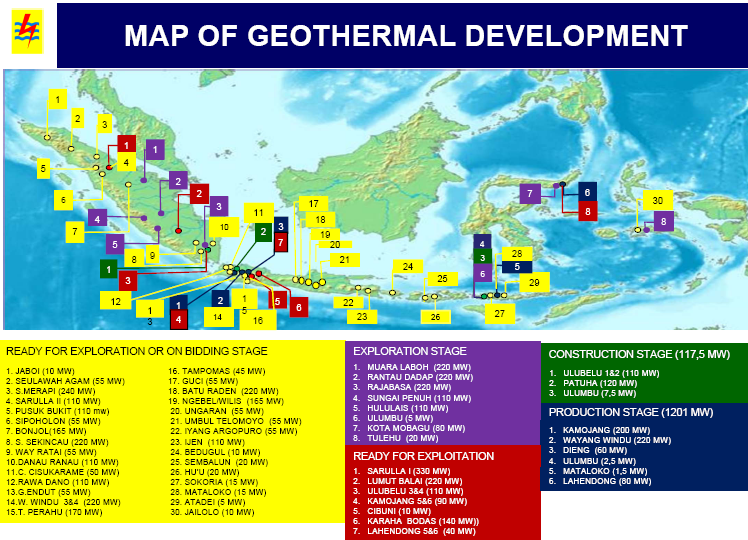 Outside Java, geothermal resources are developed in Lahendong, North Sulawesi, and in Lampung dan Kerinci. Survey team’s visit in Lahendong in 1971 involving the Directorate of Geology of Bandung, PLN, and geothermal experts from New Zealand. The survey was in 1977/1978 by the survey team from Canada, the Canadian International Development Agency (CIDA). In the 1980s, the development of geothermal business discharge characterized by Presidential Decree. No. 22 of 1981 to replace the Presidential Decree. No. 16 of 1974. According to the provisions of Presidential Decree. 22/1981, Pertamina was appointed to conduct the survey and exploitation of geothermal exploration in Indonesia. On that basis since 1982 activities in Lahendong was continued by Pertamina to conduct a survey of geology, geochemistry, and geophysics. In 1982, Pertamina also signed a working contract with a geothermal company, Unocal Geothermal of Indonesia (UGI) for geothermal wells in Mount Salak, West Java. Then in 1994 it operated Gunung Salak geothermal power plants Unit I and II. And in February 1983 in Kamojang geothermal wells were developed in a well managed, with the operation of Geothermal Power Plant (PLTP) Unit-I (1×30 MW). And then in February 1987 Pertamina successfully operated PLTP Unit II. While geothermal business at Mount Drajat, West Java, conducted by Pertamina and Amoseas of Indonesia Inc.. and PLN (JOC-ESC). In 1994 PLTP Unit I operated at Mount Drajat. In 1991 the Government once again issued a policy of geothermal business through Presidential Decree No. 45/1991 as improvements on Presidential Decree. 22/1981. In a Presidential Decree. 45/1991 Pertamina get flexibility, along with the contractor, to conduct exploration and exploitation of geothermal. Pertamina also be given more freedom to sell steam or electricity to PLN or to any legal entity licensee to electricity. In addition, in 1991 also issued Presidential Decree No. 49/1991 to replace No. 23/1981 which regulates the geothermal business tax from 46% to 34%. The aim is to stimulate increased use of geothermal energy. In 1994 working contracts was signed between Pertamina’s geothermal with four private companies. Respectively for the Wayang Windu, West Java (PT Mandala Nusantara), Karaha, West Java (PT Karaha Bodas Company), Dieng, Central Java (PT Himpurna California Energy), and Patuha, West Java (PT Patuha Power Limired). Henceforth, 1995, signing a contract (JOC & ESC) Pertamina Bali Energy Limited and PT PLN (Persero) for the exploitation and utilization of geothermal in the area of Batukahu, Bali. Still in 1995 the signing of the contract (SSC & ESC) to Kamojang Unit-IV and V between Pertamina and PT Bina Latoka Trimas Energy, and the ESC between Latoka Trimas PT Bina Energy and PT PLN (Persero). And still in 1995 issued an MOU between Pertamina and PT PLN to build geothermal power plants (1×20 MW) in Lahendong, North Sulawesi and monoblock (2 MW) in Sibayak, North Sumatra. At first, geothermal business was entrusted by the Government to Pertamina, based on Presidential Decree No. 6 of 1974 dated March 20, 1974. Despite the limited work area, namely on the island of Java alone. After that extended the working area, which was when the Government issued a Presidential Decree. 22/1981 concerning the power of enterprise resource exploration and exploitation of geothermal for power generation in Indonesia. Implementation was submitted to Pertamina. Pertamina is obligated to sell the electricity generated from geothermal to PLN. Moreover, even if Pertamina has not or can not perform such cultivation, can coexist with other parties in the form of Joint Operation Contract. Until then, geothermal business tax by 46%. This is regulated Presidential Decree. 23 of 1981. 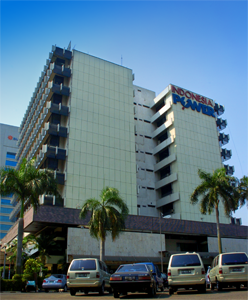 In later developments, the Government allowed other agencies (other than Pertamina), both state-owned, privately owned national company, including cooperatives to develop business in the small-scale electricity sector (10 MW) and other related purposes. This problem was governed by Presidential Decree. 45 / 1991 to improve Presidential Decree. 22 / 1981. Pertamina as the exploration power holder, to sell its geothermal, either in the form of energy or electricity not only to PLN. Then the Presidential Decree No. 49/1991 as a substitute. No. 23/1981. It regulated geothermal business fiscal obligations. It is determined that the total paid-up as part to the Government by 34% of net operating income. A JOC is a legal agreement between the contractors and Pertamina, representing the government. Pertamina is responsible for the management of the operation and the contractor is responsible for the production of geothermal energy from the contract area, the conversion of energy to electricity and the delivery of geothermal energy or electricity. The JOC allows operations for 42 years, including a production period of 30 years. The Build-Own-Operate contracts have, in each case, a partnership equity split of 90-10. Pertamina presently has no equity stake in any of the projects, its role being to collect compensation as the resource holder. The electricity is sold on the basis of an Energy Sales Contract, which is normally denominated in dollars and obligates PLN to purchase electricity on a take-or-pay basis for a period of 30 years or more. Many ESCs are being renegotiated. An ESC, an integral part of the JOC, is an agreement among the contractor and supplier of geothermal steam, Pertamina as the seller, and PLN as the purchaser of geothermal energy. Under this agreement, the production period for delivery of geothermal energy from each unit is 30 years from the date of commercial generation for each unit. The term of an ESC is 42 years. The very attractive incentive decrees of the mid-1990’s were replaced in 2000 with Presidential Decree No. 76. Under PD 76/2000, the GOI proposes to take all or part of the exploration activities. Tax payments, however, will be in accordance with general tax law rates, i.e., 47% instead of 34% under previous PDs. 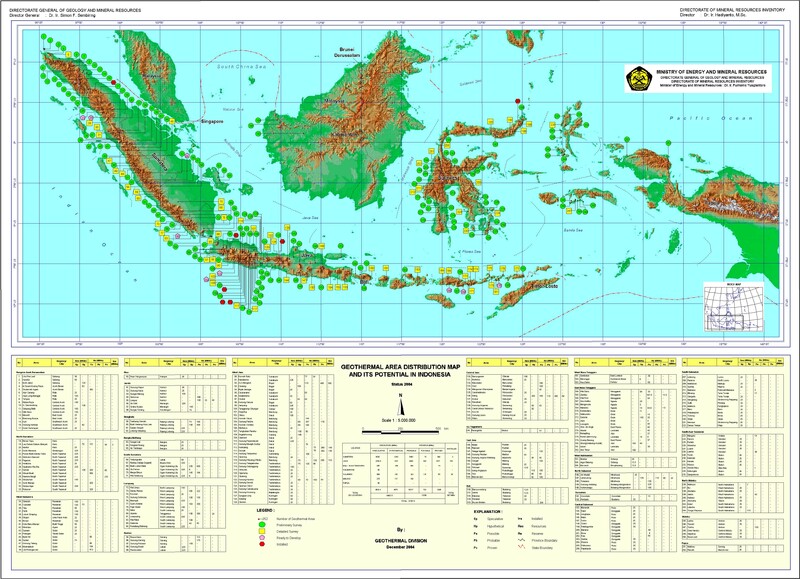 No exploration activities have taken place since the enactment of PD 76/2000. The geothermal industry has been attempting since the enactment of PD 76/2000 to develop a geothermal law which would more permanently fix the conditions of taxation, regional authorities, and exploration-risk sharing. The draft law is currently still being debated. Law No. 27/2003 encourages the development of integrated geothermal projects by public and private sectors without the need for a JOC with Pertamina. The objectives of Indonesia’s Geothermal Law No.27 of 2003 are: To provide a stronger legal basis for upstream geothermal energy developments, including private investments in the sector; and to expand regional autonomy in Indonesia to support sustainable energy alternatives to fossil fuels. The law clarifies the regulatory structure surrounding geothermal development. Geothermal Business Permits (IUP) are granted by the authority of the state. They only concern use of geothermal resources, not of surface land. First, a Pre-tender field survey is done by the government (Art 10). Afterwards, the Minister determines Geothermal Working Areas (Art 9) offered for competitive bidding to prospective investors. Eventually, IUP are issued by the Minister, Governor or Regent/Mayor, according to their authorities (Art 21). The term of an integrated business permit is divided in three steps: The exploration term (extendable twice for a one year period), the feasibility study (for a maximum term of two years as of the expiration of the exploration term) and the exploitation phase for a minimum term of thirty years (extension possibility). Mininstry Regulation No. 005/2007 on the Guidelines for Geothermal Preliminary Survey Assignment. Ministry Regulation No. 11/2008 on the Mechanism for Determining of Geothermal Working Area. Ministry Regulation No. 2/2011 on Based price for Electricity produced by Geothermal Plant (this regulation provides a detailed explanation on how PLN should buy power from geothermal producers, including a clause ordering the company to refer to the reference price of 9.7 US cent per kilowatt hour (kwh)). Ministrial Regulation of MEMR No. 22/2012 on geothermal price structure. MoF decree No. 177/PMK.011/2007 about Dispensation Entry Fee of Imported Goods for Petroleum Upper Course Activity, Gas and Geothermal. MoF Decree No. 242/PMK.011/2008 about Value Increment Tax which is Charged by the Government for Goods imported for Exploration Effort of Petroleum Upper Course and Petroleum. Government Regulation No. 62/2008 improvement on Government Regulation No. 1/2007 on Income Tax Facilities for Capital Investment on Certain Corporate Works and or in Certain Regions, which gives Income Tax Facilities for Capital Investment such as Geothermal sector. MR of MoF No. 22/PMK.011/2011). The aim of the government is to increase the rate of geothermal development so that there will be close to 4,000MW delivered by 2014. This means a fourfold increase and would require a significant increase in the level of investment that would have to be very large to even produce a small geothermal power plant. The success of any geothermal project would depend on the inclusion and investment of large companies.Indonesia has come up with enticing financial incentives to support potential investors. The Indonesian Finance Ministry has infused the Indonesian Green Investment Fund with about $80 million to provide a revolving fund to clean energy projects, including geothermal. The Indonesian government does not levy import tax on equipment or technologies necessary for the construction and operation of geothermal projects. The government will also bear additional tax of investors in the geothermal sector. Their income tax will also be cut. There are still environmental concerns about geothermal energy. An estimated 42 percent ofIndonesia’s potential geothermal reserves are located within protected or conservation forests, the latter of which is off limits to geothermal production according to 1999 forestry law. The law does allow geothermal plants in production forests as well as protected forests. The government wants to harness geothermal energy to address both energy and climate change issues, despite the risks it poses on the surrounding environment, as 70 percent of the 265 geothermal deposits spread out across the country are in protected conservation areas. This is because Indonesia has pledged to reduce 26 percent of its emissions by 2020 and to aggressively develop renewable and clean energy sources in the country. It expects geothermal power to account for 5 percent, or 9,500 MW, of the national electricity demand by 2025. Currently in Indonesia has 1,345.3 MW of geothermal power plant (PLTP), which has been producing, such as PLTP Sibayak, North Sumatra (12 MW), Mt. Salak, West Java (377 MW-including 2 MW of optimization program), Wayang Windu, West Java (227 MW), Kamojang, West Java (200 MW), Darajat, West Java (270 MW-including optimization program of 15MW), Dieng, Central Java (60 MW), Lahendong, North Sulawesi (82.5 MW), and Mataloko (1,8MW), in East Nusatenggara. In accordance with the Strategic Plan of the Ministry of Energy and Mineral Resources, in the year 2014 is expected later installed 5795 MW from the plant.